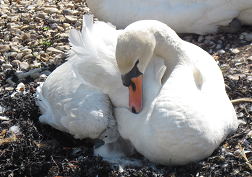 Trafalgar Wharf: MAY BANK HOLIDAY OPENING TIMES AND THE SIGNETS HAVE ARRIVED! MAY BANK HOLIDAY OPENING TIMES AND THE SIGNETS HAVE ARRIVED! Trafalgar Wharf Reception will be open on Saturday 4th May as normal. For electric cards, queries and emergencies please go to The Drystack on the other days of the bank holiday. If you are a Drystack customer, then the team are here for the whole weekend, should you want your boat launched for a sunny day out in the Solent! Spring has definitely arrived as the tulips are blooming and we had our first signet hatch today. If you are lucky enough to see them please take care as both swans are a bit protective of their family. We all hope you have a lovely weekend!